Most WWF T-Shirts are available in sizes L-XL-XXL. "Do you smell what the ROCK is Cooking?" The Rock's new SLEEVELESS T-Shirt is finally here! This new t-shirt is awesome. The detailing of the Brahma Bull makes it jump of the t-shirt. Brand New, this is a cool new football jersey. It is a black mesh jersey, so you can still get some air in those hot, dog days of summer. Front: A huge, drooling Brahma Bull. Back: Lettering that spans the back THE ROCK, outlined in bright red. Great new cap of the "Great One!" 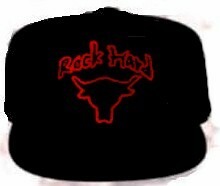 The cap is black with a fully embroidered front in red . This is a cool new item. It is a key chain, a bottle opener and a can opener all-in-one! This an awesome portrait t-shirt. This is the "Eyebrow" at its best. FRONT: A great photo of the Rock, giving the Eyebrow, great shot of the tattoo, too. 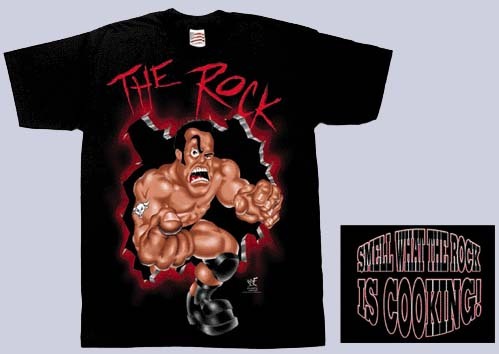 BACK: Says "Smell What The ROCK Is Cooking" Come on, do you think he will be McMahon Stooge forever? I think that soon, the new slogan will be, "McMahon didn't screw The People, The People screwed McMahon!" Know your Role and buy this tee! Brand New, YOUTH Size T-shirt! You're kid(s) are going to love this awesome animated t-shirt! FRONT: A great cartoon of the Rock, giving the Eyebrow. BACK: Says "Smell What The ROCK Is Cooking"